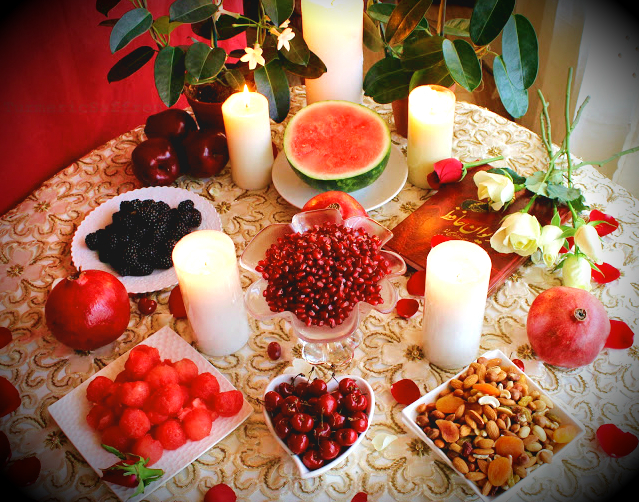 شب یلدا Shab-e yalda (eve of yalda) is traditionally a night for friends and family to gather together to enjoy a delicious feast of seeded pomegranate, watermelon slices, ajil (nuts and dried fruits) and sweets, celebrating the victory of light over darkness. The dinner menu may vary for each family partly depending on which part of the country you are from. The traditional dinner may include ash-e reshteh, reshteh polow, sabzi polow and mahi (fish), fesenjoon, kashk-e bademjoon among many other favorites. A couple of weeks ago my blog turned four years old! That's just beyond what I had in mind! This food blog as many of you might know was a spur of the moment decision as a way of coping with the pain of a great loss in my life. This was a challenge for someone whose native language isn't English, and wasn't into writing, taking pictures, or cooking professionally. However, through blogging I have pushed through my limitations and boundaries and in the process I have learned so much. On the eve of yalda I would like to thank all my loyal fans who, through their sweet and kind comments, e-mails, tweets and joining my Facebook fan-page, have always supported me and warmed my heart. I cherish all your feedback. It makes me very happy to read a fan's email who made an anniversary three course meal for his new bride, a reader who baked cake yazdi and took it to work and everyone loved it, or a reader who has tried making many of the recipes and takes the time to come back and write about it and let me know how it went. I am very grateful to all of you who spend time reading my blog. 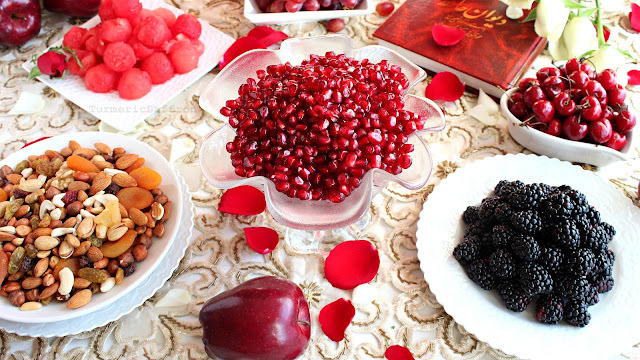 Shab-e Yalda Mobarak! Happy Winter Solstice! For my first post of the fall season I have chosen this tasty and perfect for every occasion حلوای هویج halva-ye haveej (carrot halva). I also wanted to share this recipe for more reasons besides it being simply delicious. In our house we are big fans of carrots. We like plain and raw carrot sticks and the idea of cooked carrots never appealed to me since my daughters have always disliked mushy carrots. However, this time I decided to do something different with some of the 10-pound bag of carrots in my refrigerator. For inspiration, I went to my feel-good, old Iranian cookbook! There may be many beautifully illustrated and well designed cookbooks with high-gloss covers out there but for me this unpretentious cookbook by Mansoureh Amir Ebrahimi that my mother gave me many years ago gives me a rare glimpse into the past where the traditional recipes could feed an army and kitchen gadgets such as measuring tools and scales were unheard of. I like to find those rare home-style recipes that were made in real kitchens by home-makers that simply wanted to feed their families healthy and delicious meals. As I leafed through the loose pages of the cookbook I was drawn to the simplicity of this healthy recipe that warms your heart on chilly autumn days. This is my second post from this cookbook. 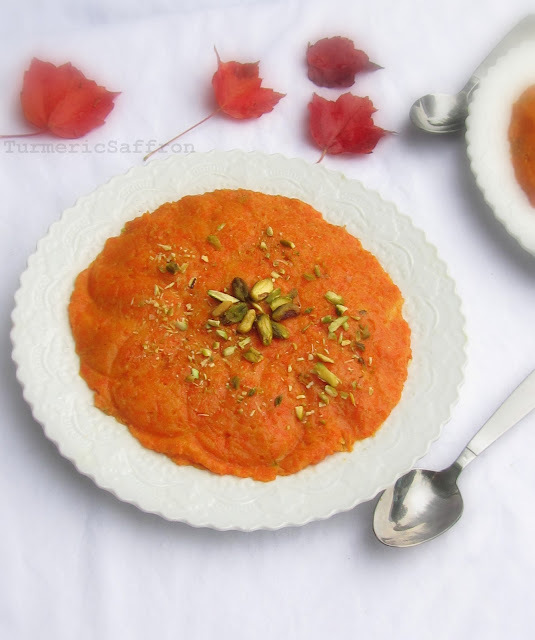 My first post was ash-e somagh (sumac soup). 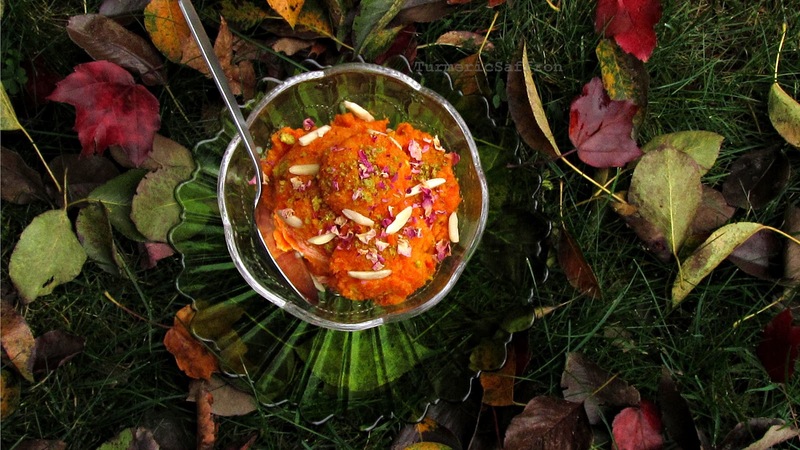 The most popular halva in Iranian cuisine is made with wheat flour (preferably whole wheat). 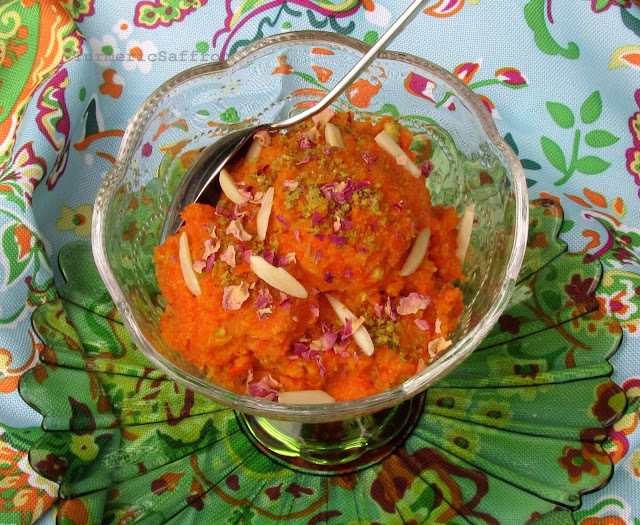 However, carrot halva is gluten free and dairy free but has the creamy texture of pudding. You can reduce the amount of sugar and butter further for a healthier dessert. I have more or less stayed true to the recipe but I had to reduce the amount of ingredients the recipe calls for and make a few minor changes. This is one of those recipes that is meant to be shared by sending a plate over to a friend, relative or neighbor. Combine the sugar and 1-1/2 cups of water in a small pot, bring to a gentle boil on medium heat stirring well until sugar is completely dissolved. Set aside. Place the shredded carrots in a pot, add 1-1/2 cups of water, cover and cook over medium-low heat for about 30-40 minutes or until carrots are soft. 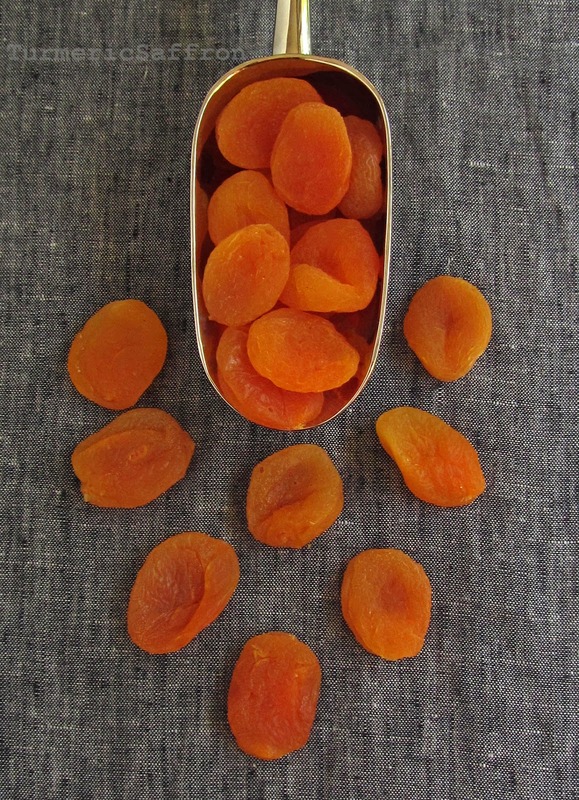 Mash the carrots using a hand masher, electric mixer or a fork for a smoother consistency. In a large sized skillet with a cover melt the butter over medium heat, add the sifted rice flour, stir frequently until the flour turns light golden brown. Add the mashed carrots to the rice flour. Mix well. Gradually pour the sugar syrup over the carrot and rice flour mixture. Add saffron, rose water and cardamom. Combine thoroughly. Cover and cook over low heat until the flavors come together for another 30 minutes. 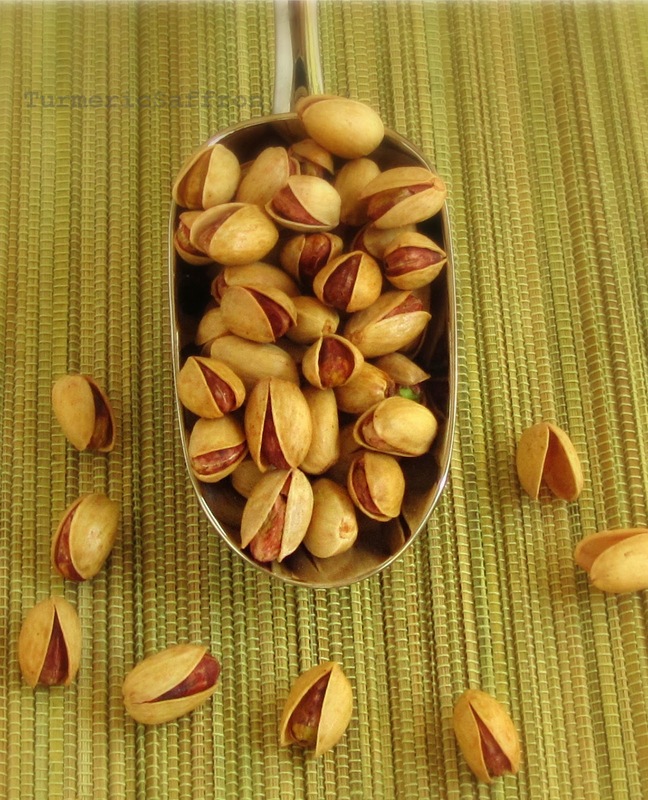 To serve, scoop the halva onto a serving platter and smooth out the surface with the back of a spoon and sprinkle the top with pistachios. روز اول ماه مهر Rooze avale mah-e Mehr (Iranian first day of autumn and the first day of school) is just a few days away and there's that familiar sense of excitement in the air that takes you back to your childhood and all those first day of school memories. 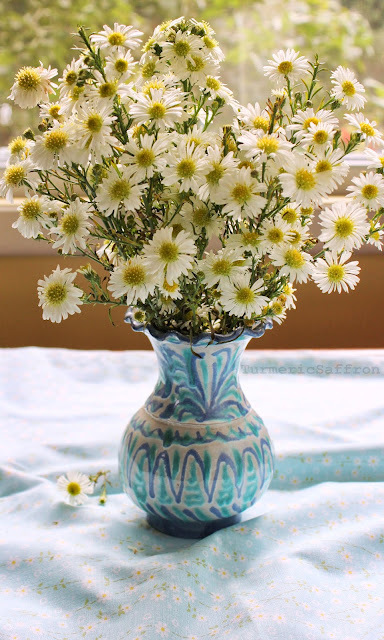 The word "mehr" also translates to the sun and kindness in Persian. In addition to my own nostalgic memories of rooze avale Mehr I also remember my daughter's first days of school. Many of those precious moments were captured in adorable photos of them with their new school clothes standing in line with other children waiting for their teacher to arrive or waving excitedly to familiar faces on the playground. Every year, along with feelings of anticipation and excitement there were all those concerns and worries about making sure they get a good education, find good friends, and get involved in sports or some extracurricular activities that they would enjoy. There was also the major concern regarding what they were going to eat while at school and when they got home, especially with their ever changing taste buds. 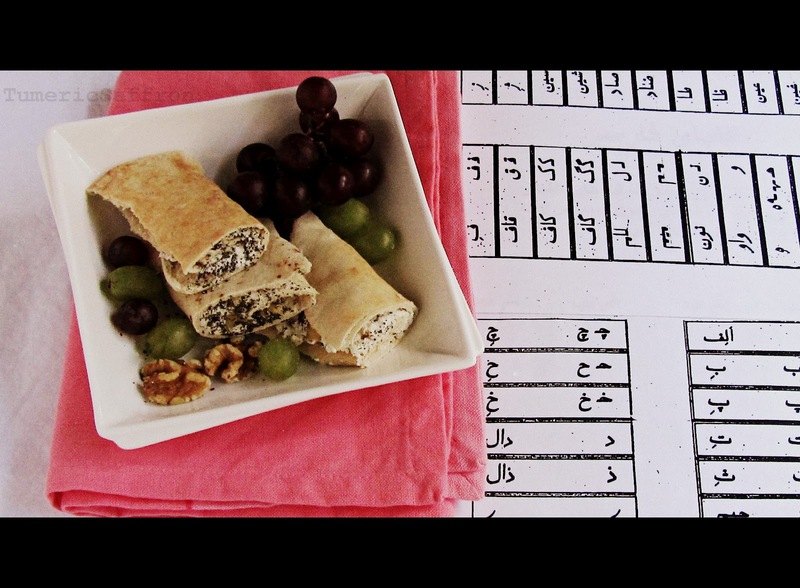 Choosing a تنقلات سالم tanaghlat-e salem (healthy snack) is a big challenge when there are unhealthy foods all around. How can you send your child to school with a pita bread and feta sandwich when the school offers them chicken nuggets and french fries that look more appealing to them. The temptations of eating potato chips, cookies and candies as snacks is very strong for most kids and difficult to overcome. Children need to learn about nutrition, healthy alternatives and get involved in the kitchen at a young age. 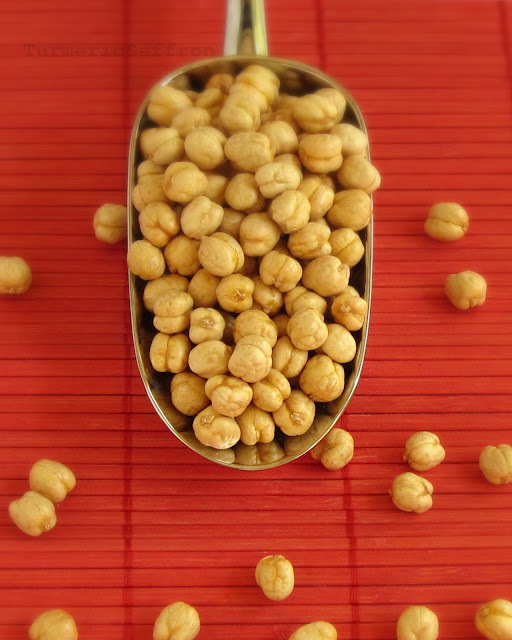 Looking back, I realize that the kind of تنقلات tanagholat (snacks), or ghagha-lili, that we would have was the best and a much healthier choice than what's being offered out there today. There was some junk food back then too but nothing would make it to our home without my mother's approval and when it came to what we would eat she was very much involved. 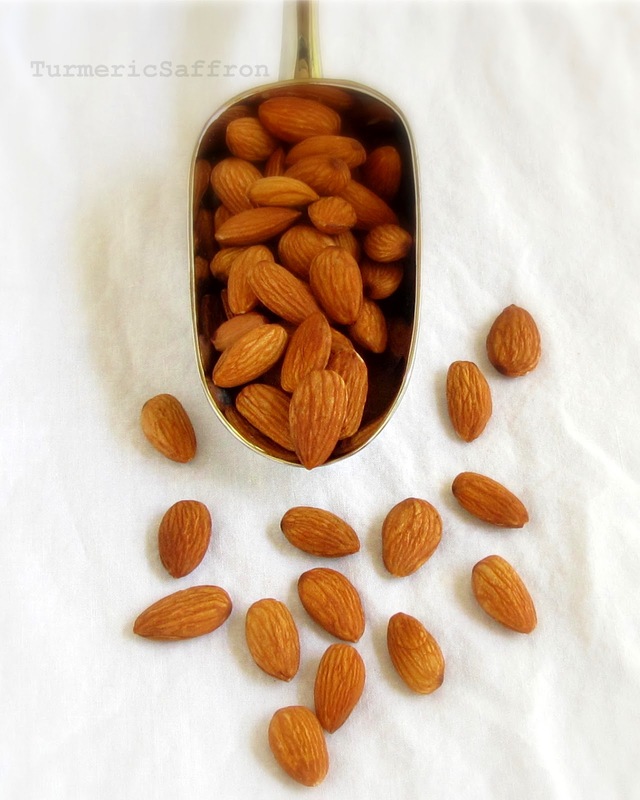 I can easily say that we grew up on fruits, vegetables, noon o paneer (flat bread and Iranian cheese), nuts and dried fruits. 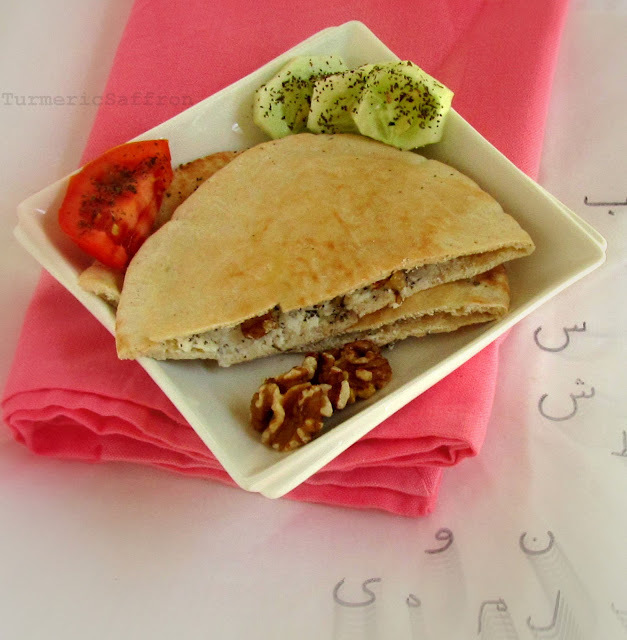 I usually spread the feta cheese with crushed walnuts and dried mint on bread (taftoon, lavash, barbari or pita). To this day I find those snacks to be the tastiest and healthiest snacks for school, after school or just everyday healthy snacking. Here's a list of some of those tanagholat that we filled our pockets with. Enjoy! Have a great school year! This is a repost of the recipe I wrote back in 2008 when I was a brand new food blogger. خوراک لوبیا Khorak-e loobia is a near and dear dish to my heart not just because it's delicious and healthy but because it brings back treasured memories of when life seemed so simple and all your troubles could be gone with your mother's encouraging words and warm hugs. I'm not sure how this post never got published correctly. The link to the original post doesn't go anywhere. There seems to be a disconnect between the link and the actual post and the only way you can see it is by going through the archives of that year. I am not that computer savvy and I don't know how to fix this problem. Since I didn't want to let this post disappear on my blog I decided to post it again! My mother had a large, fish-shaped glass serving bowl with scale and fin patterns that she would use for serving these cooked beans. I am always on the look out to find the exact replica of that fish bowl but haven't found it yet. My mother's recipe called for using a generous amount of olive oil, extra ab-limoo (freshly squeezed lemon juice) and no tomato sauce. However, I added a little tomato paste to this recipe. I like the combination of red kidney beans and the tomato flavor. You can make khorak-e loobia with tomato paste/tomato sauce or even fresh tomatoes or without it. Also, you can use red vinegar instead of lemon juice. 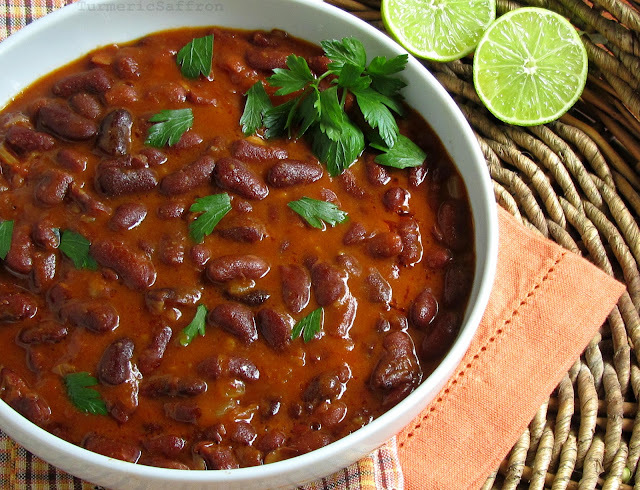 Khorak-e loobia can be made with pinto beans as well. 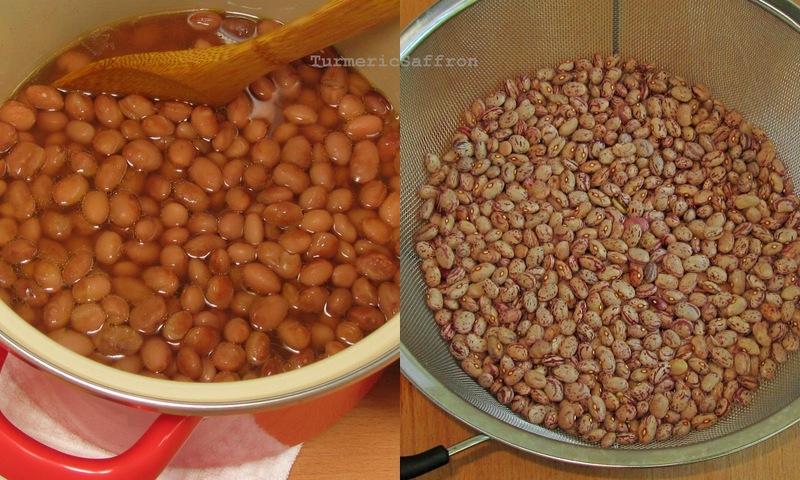 Pick over the beans, rinse thoroughly and soak in water overnight. Pour the soaking water out, rinse and place the beans in a large pot, add six cups of water, bring to a rapid boil on high heat, reduce the heat and cook for 15 minutes over medium-high heat. Drain the beans in a colander, return back into the pot, add enough water to cover by a couple of inches, cover and cook for an hour on medium heat. In a skillet, saute the chopped onions in olive oil until golden brown. Add garlic and saute for another 2-3 minutes. Then add the tomato paste, salt and pepper, saute for another 1-2 minutes, stir well. Add a cup of warm water, simmer on low heat for 10-15 minutes. Pour the content - onion, garlic and sauce mixture into the pot, stir. Add lemon juice, taste and adjust the seasoning, cover and simmer for another 20-30 minutes. 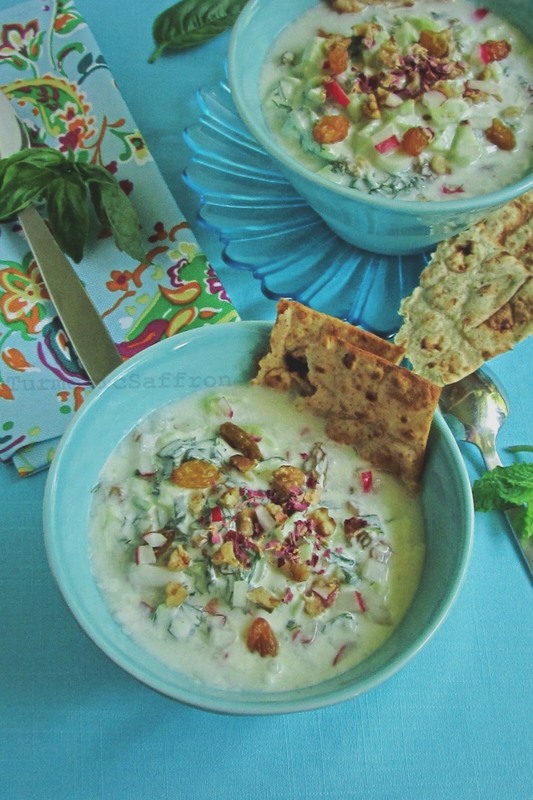 Khorak-e loobia can be served warm or cold with warm bread, kotlet, and salad shirazi. P.S: I tweaked the recipe just a little bit and added new photos. مرباMoraba-ye Zoghal Akhteh (cornelian cherry jam) recipe was a last minute decision as I was through simply eating a handful of these different shades of red tangy oval-shaped fresh summer fruit. Cornelian cherry has many health benefits and depending on their ripeness their taste ranges from slightly bitter to tart and tart-sweet. With only a bowl of zoghal akhteh left on the kitchen table I decided to make jam and I'm happy to say that the jam turned out great. Although, lavashak-e zoghal akhteh (fruit roll-up) still remains to be my favorite way of eating this amazing fruit. If I had a zoghal akhteh tree in my backyard I would spread out a malafeh (bed sheet) or a sofreh (tablecloth) under the tree and shake the branches vigorously and gather all the fruits but this small batch of fruits were picked from a Cornelian cherry tree on a public property in a New York area. I only learned its English name when I posted a photo of zoghal akhteh on my Facebook page and thanks to my lovely FB page fans I found out its correct name. Let's hope that in the future fruit growers and producers make this delicious fruit readily available at farmers' markets here so we wouldn't have to hang from tree branches in parks and busy streets in front of curious passersby. 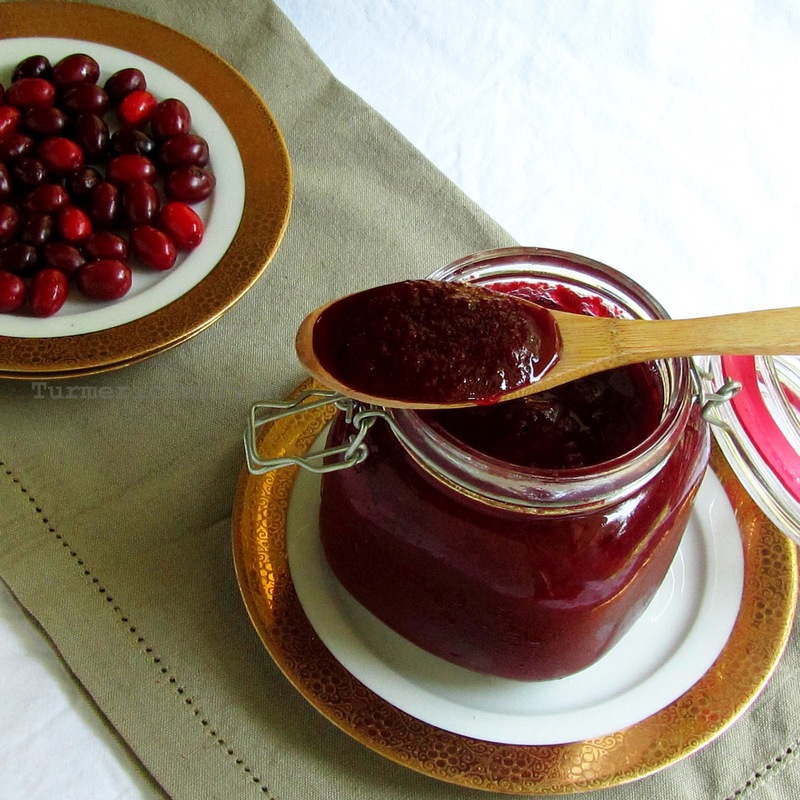 In the meantime, I enjoyed this rare find and although cornelian cherries are hard to find and are not available everywhere I would like to share this jam recipe with you all. For me, zoghal akhteh is reminiscent of those hot summers in Tehran with all the best snacks and sour fruits such as walnuts in brine, faloodeh, goojeh sabz (green sour plums), shahtoot (mulberry), and plump dried zoghal akhteh to name a few. I tried to remove the pits prior to cooking but the Cornelian cherry pit is hard to dislodge. 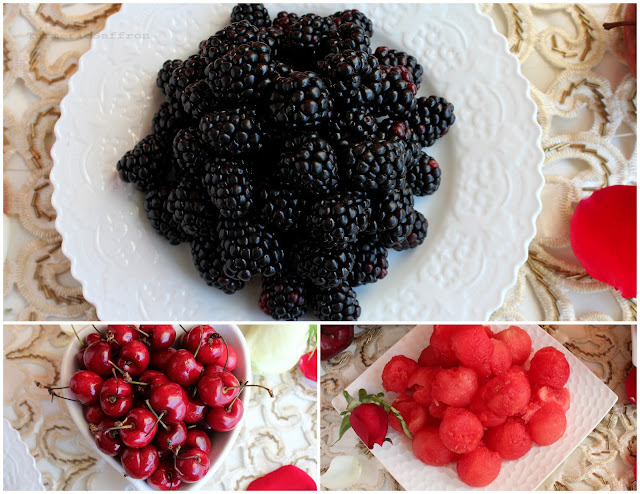 I thought of all the women that I had seen throughout my young life in Iran who patiently sat around a sofreh and meticulously prepared fruits and vegetables for jams and pickles which back then seemed like a pointless waste of time. In recent years, I am paying more attention to how I cook and especially over the past three and a half years of blogging maintaining the authenticity of recipes has become increasingly important for me and the long ingredient list or the length of time it takes to cook is no longer overwhelming. However, after removing some of the pits with a small sharp knife, I decided to take a less tedious and a much quicker approach of partially cooking the cherries and removing the pits. My mother would always prepare the sugar syrup in advance and add it to the jam during the cooking process. However, since I had already pre-cooked the cherries I decided to add the sugar directly to the pot to avoid the jam being too runny. If you would like to use the traditional method of using the sugar syrup, add a cup of water to 2 cups of sugar in a small pot, bring to a boil on medium heat, stir to dissolve the sugar fully and simmer till it thickens. 2 cups sugar, amount of sugar can be adjusted to your liking, (I prefer it on the tart side). Place the cherries in a non-reactive heavy-bottomed pot. Add about 4 cups of water, bring to a rapid boil over medium-high heat. Reduce the heat and simmer on medium-low heat for 15 minutes. Don't leave the boiling jam unattended. Stir frequently and remove any foam if necessary. Place a mesh colander into a large glass bowl. Remove the pot from the heat and pour the content into the colander. 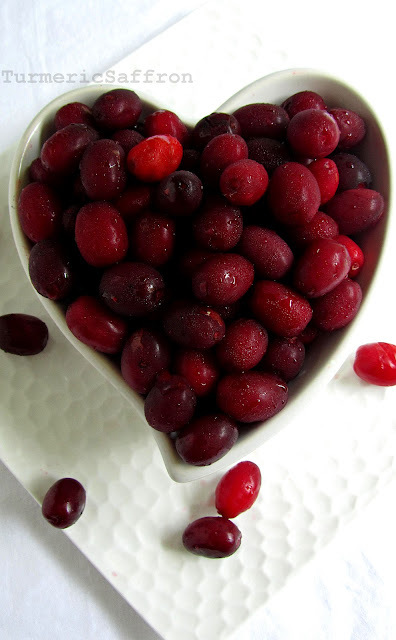 Mash the cornelian cherries with a potato masher or put them through a food mill and remove the pits. 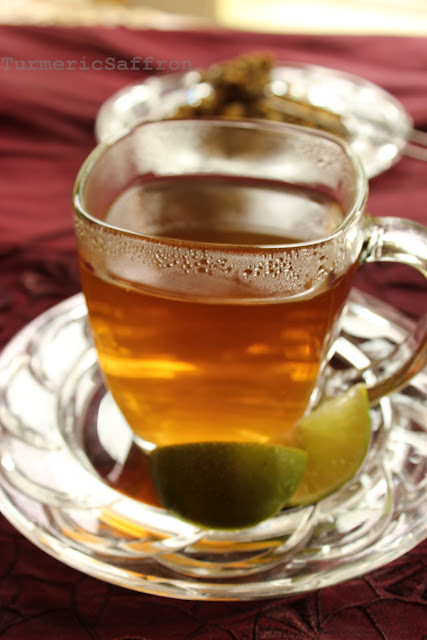 Return strained liquid back into the pot, add juice of a lime, sugar, cardamom powder and bring to a boil on medium-high heat. Let the mixture boil for about 5 minutes, stirring frequently. Reduce the heat, add rose water, simmer on medium-low heat for 20-30 minuets or until it thickens. 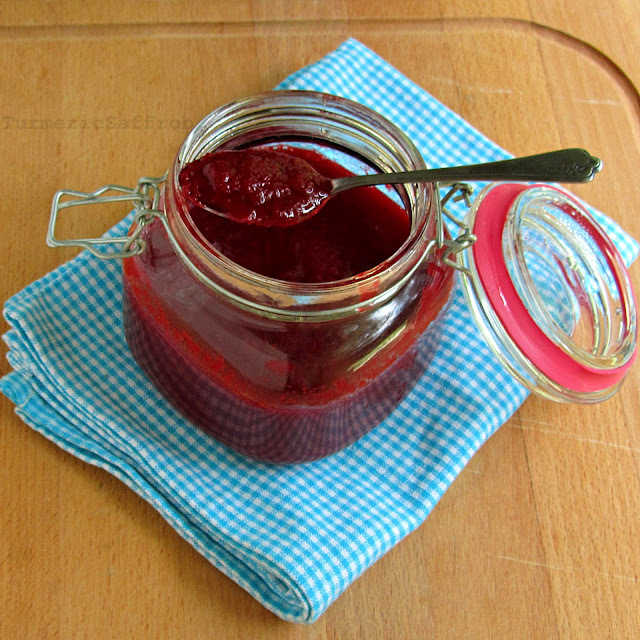 Pour the jam into a clean glass jar and refrigerate. 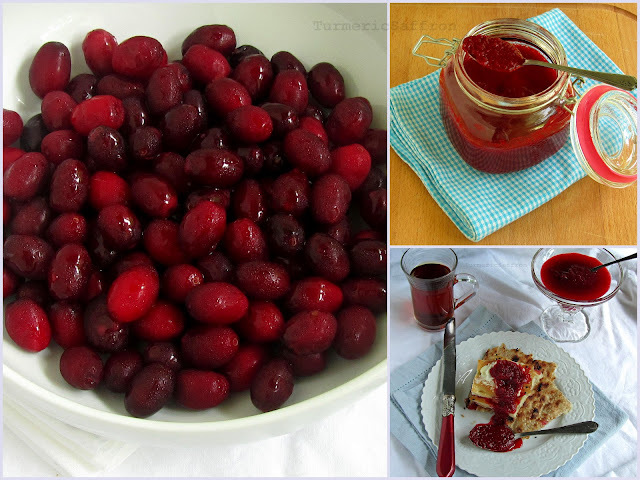 You can place the left-over pits, any flesh clinging to the pits and skin mixture into a small pot, add a cup of water, cover and bring to a boil on medium heat for 10-15 minutes to get the most of these cherries. 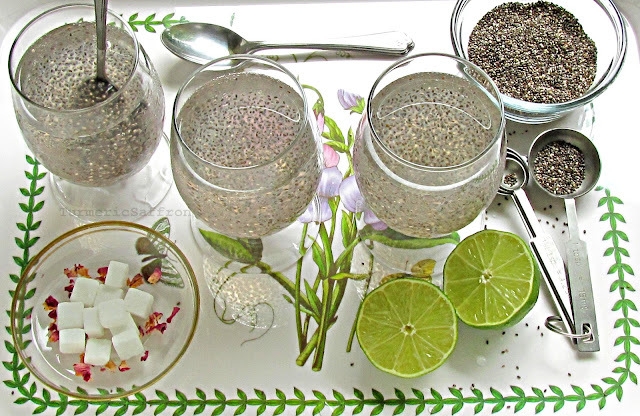 Strain the mixture through a sieve and make a very tasty summer sharbat/sherbet. 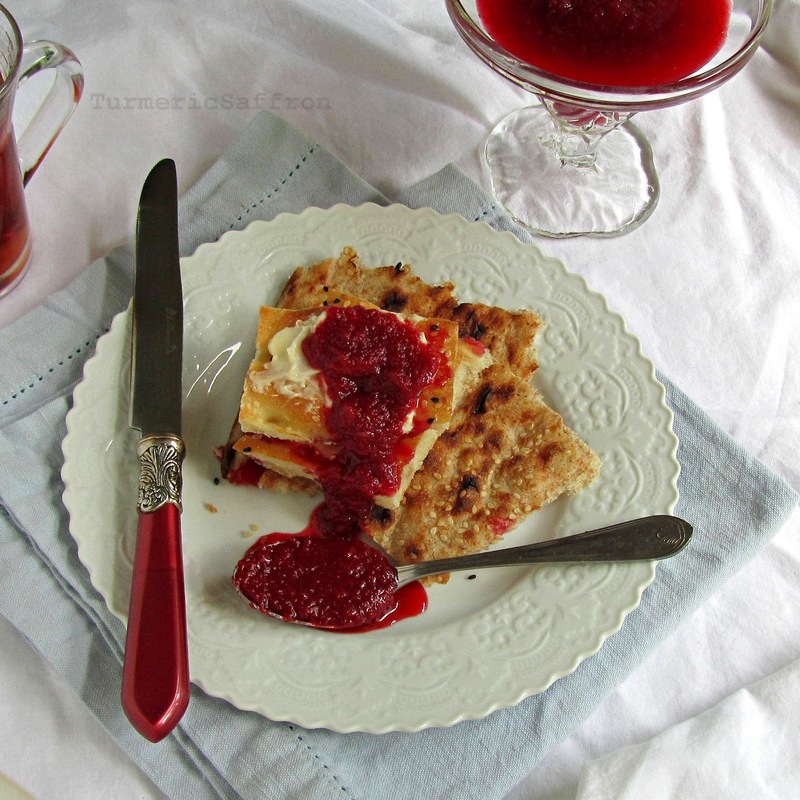 Serve moraba-ye zoghal akhteh with butter or feta cheese and warm noon barbari or sangak. I wish I could translate the above poem, "Man che Danam" (How do I know), but I'm afraid the result would be less than ideal and it wouldn't convey Rumi's message fully and would only be a watered-down version. The summer heat and humidity persists, which gives me a good reason to write about this traditional and cooling Iranian-style summertime sharbat (sherbet). I had briefly mentioned tokhme sharbati in my post about khakshir, stating that it may be added to a glass of khakshir drink for a richer drink. 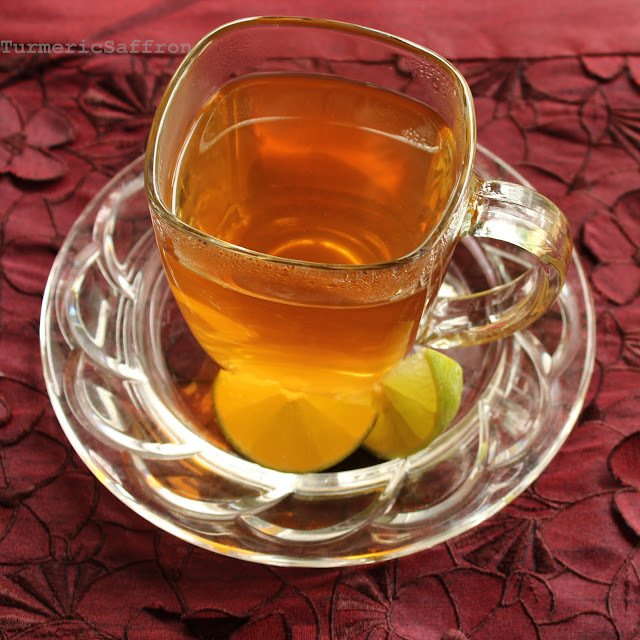 However, I feel that شربت تخم شربتی sharbat-e tokhme sharbati needs to have its own post and be recognized as a delicious and nutritional herbal drink with many health benefits. 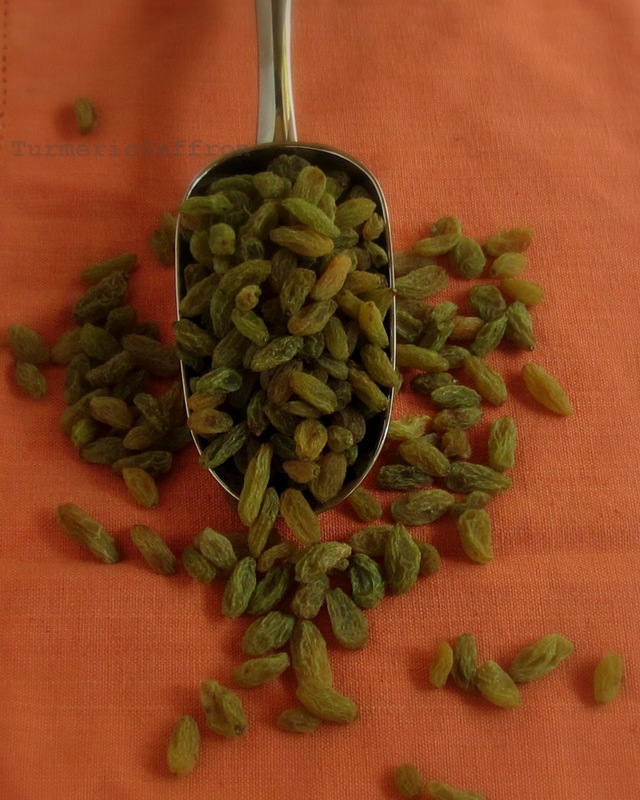 Tokhme sharbati is known to cool down the body, help improve hydration and is a good source of antioxidants. It's also a beautiful drink to have, with its grayish fuzzy seeds floating in the ice-water glass. It's like looking at the nighttime silver blue sky covered with the tiniest gleaming stars that seem connected from afar but are actually very far apart. Finding the English name for tokhme sharbati was quite a challenge. The label on the package that I purchased from an Iranian grocery store said chia seeds. 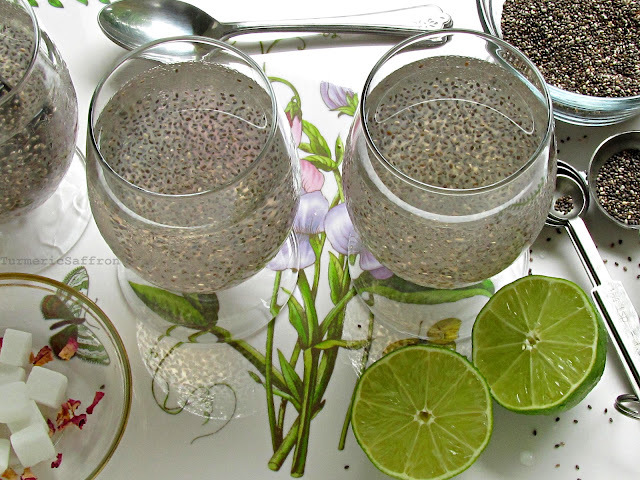 However, after Googling tokhme sharbati, I also came across names such as basil seeds or mountain basil seeds. 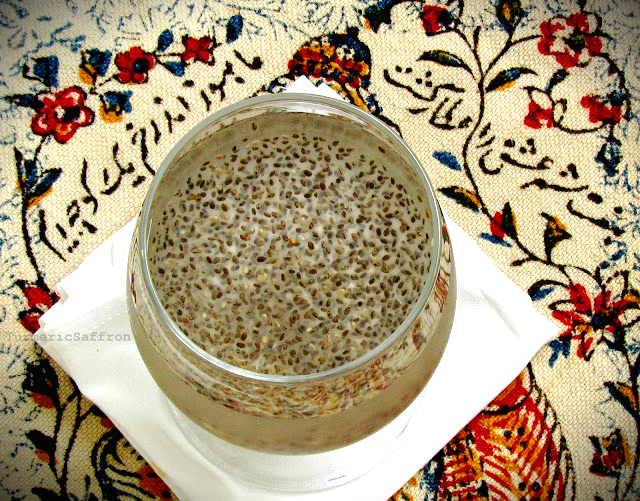 شربت Sharbat have a long history in the Persian cuisine with many variations. 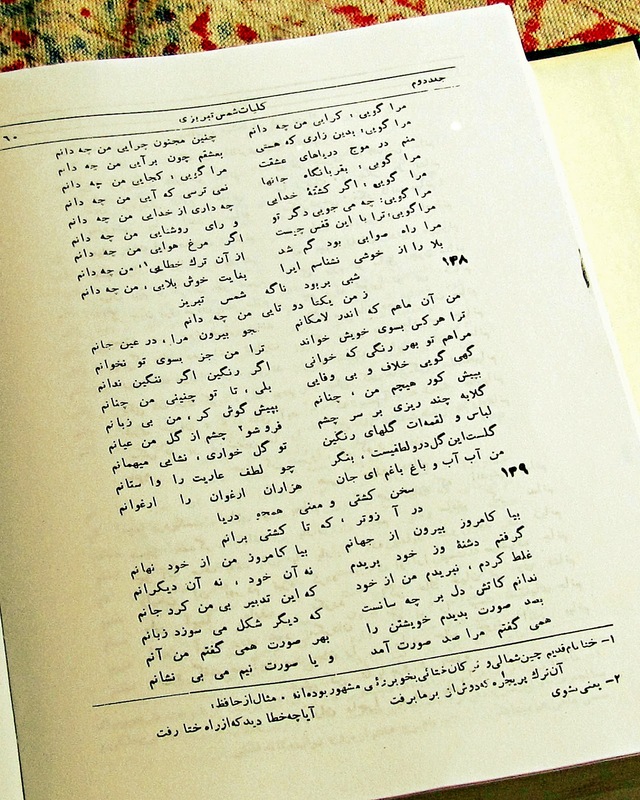 Ismail Gorgani wrote in his 12th century Persian book, Zakhireye Khawrazmshahi, which was very much influenced by Ibn Sina's book of Qanoon (Canon of Medicine), about sharbats such as sekanjabin, pomegranate, etc. 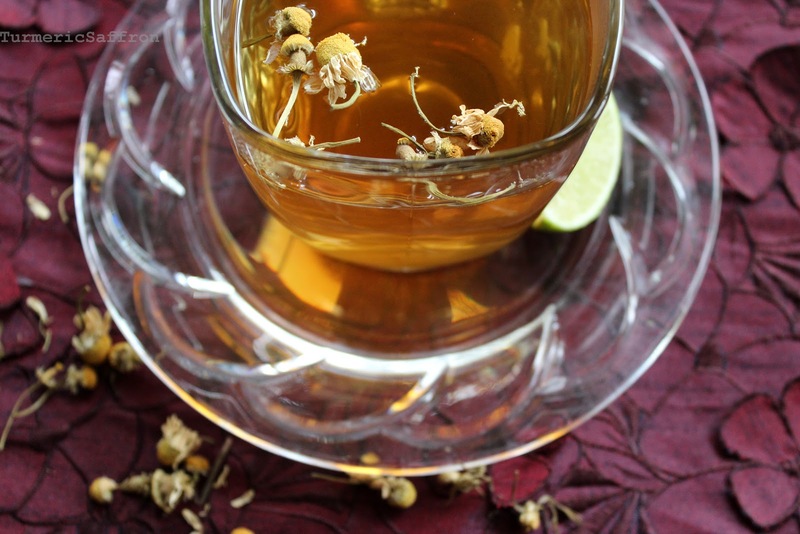 These sugar-sweetened drinks may be made with fruits, vegetables, herbal seeds, rose water and saffron. 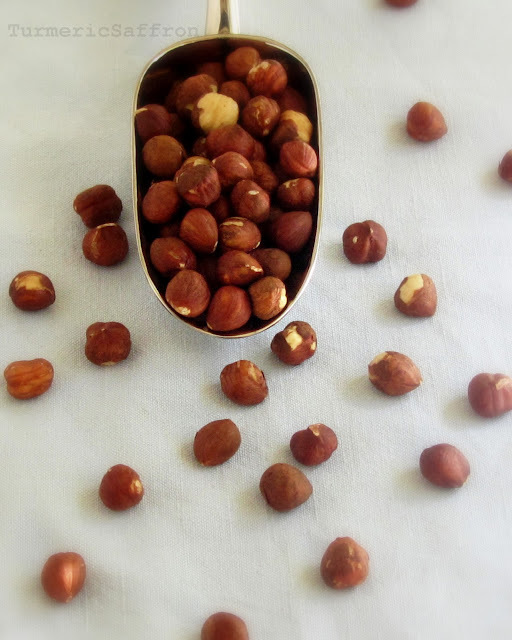 Now that we are told not to eat too much sugar and almost everyone is concerned about not becoming diabetic, I reduced the amount of sugar in this recipe compared to the recipe that was used in our home growing up. You may want to adjust the amount of sugar/sugar syrup to your taste and your diet. You can also substitute honey for sugar. I should point out that the authentic Iranian way of adding sugar to any sharbat is to make a sugar syrup first. For sugar syrup, add a cup of sugar to a cup of water in a small pan, bring to a gentle boil on medium-high heat, stir until sugar is completely dissolved. Lower the heat and simmer for another 15-20 minutes until the syrup is reduced and thickens a bit. Stir the sugar in 1/2 cup of warm water until fully dissolved or use a couple of tablespoons of the sugar syrup as explained above. 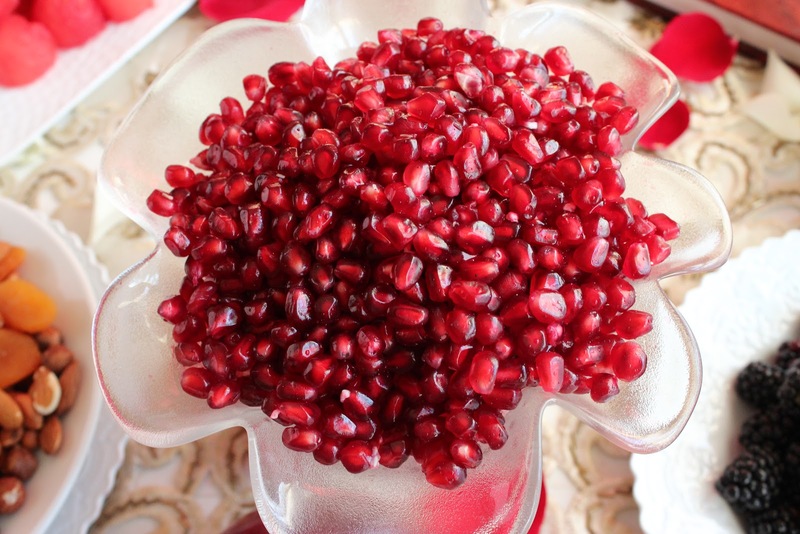 Combine the seeds, water and the dissolved sugar, refrigerate for at least 2 hours for the seeds to plump up. Add the rose water and a few drops of lime juice to taste. The drink is best served cold. 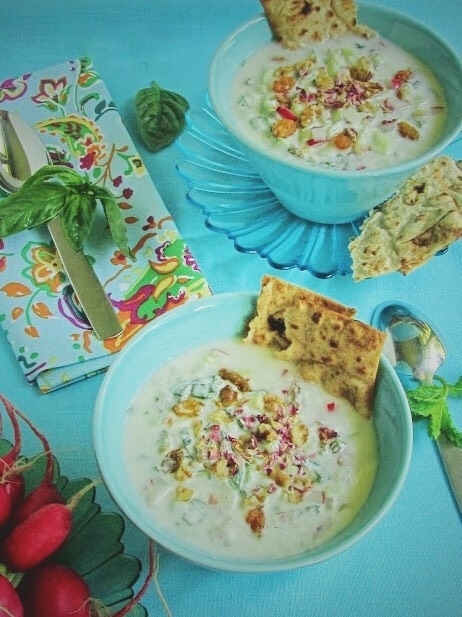 آبدوغ خیار Abdoogh khiar is a chilled yogurt soup with lots of aromatic fresh herbs, diced cucumbers, chopped radishes, crushed walnuts and sweet golden raisins topped with dried rose petals and served with pieces of dried/toasted flat bread. 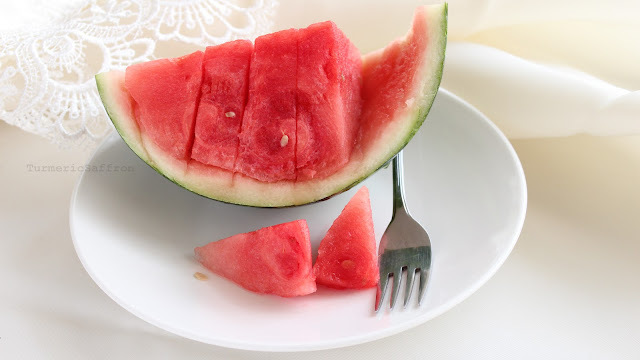 With the temperature pushing 90 degrees Fahrenheit for the past several days this traditional summer recipe replenishes you and keeps you cool during this hot, sauna-like weather. Then all you need is to take a 15-minute nap right after! That's how I remember it being in our home. Most of you who grew up in Iran probably remember the dreaded grown-ups' chorte baad az nahar (nap after lunch) in your home and that you were not allowed to play outside while they were napping. This was way before the world of text messaging, Twitter, Facebook and internet to keep you busy. However, we were not as bored as the kids these days that seem to have everything. Yogurt is a staple in Persian cuisine and it's usually served either plain or as mast o khiar, a healthy side dish for most meals, or as doogh, our favorite yogurt drink. You most likely already have the main ingredients either in your refrigerator, cupboards or right on your kitchen table and what makes it easy is that the exact measurement of the ingredients is not really necessary. I posted this recipe a long time ago as just mast o sabzi without making it into a cold soup. This is more or less the same recipe with some minor changes. 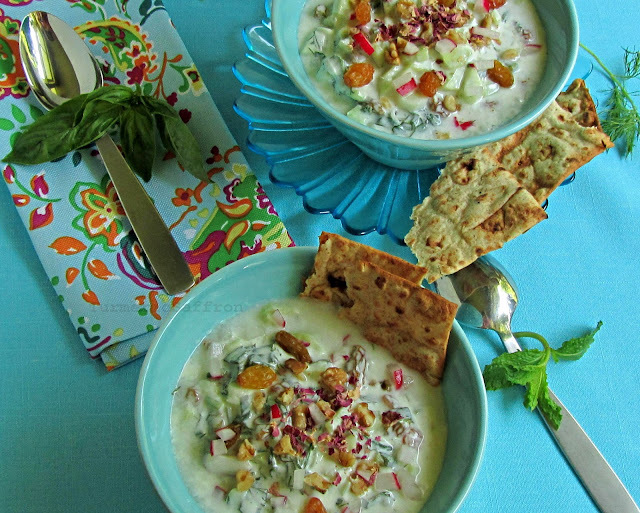 For this recipe, it's best to use mast-e kiseh (thick yogurt) for a creamier soup. To that you can either add cold water or ice cubes. Make sure not to make it too watery. Also, if you happen to have any leftover dried flat bread, cut them into pieces and add to the soup a few minutes before serving. This way the bread won't be too mushy and would still have some chew. You can add dried herbs to the cold soup if fresh ones are not available. In a large bowl beat the yogurt with a whisk for a couple of minutes until smooth. Add the chopped cucumbers, radishes, chives, mint, basil, tarragon, savory, dill, raisins and walnuts, mix well. Add salt and pepper to taste. Refrigerate for a couple of hours. Remove from the refrigerator and slowly add a little bit of cold water while mixing until it reaches the consistency you like. I like to add 1/2 cup of crushed ice. About 5-7 minutes before serving add the pieces of bread to the soup or serve on the side. Taste and adjust the seasoning. To serve, ladle abdoogh khiar into a large serving bowl or individual bowls and garnish with dried rose petals. 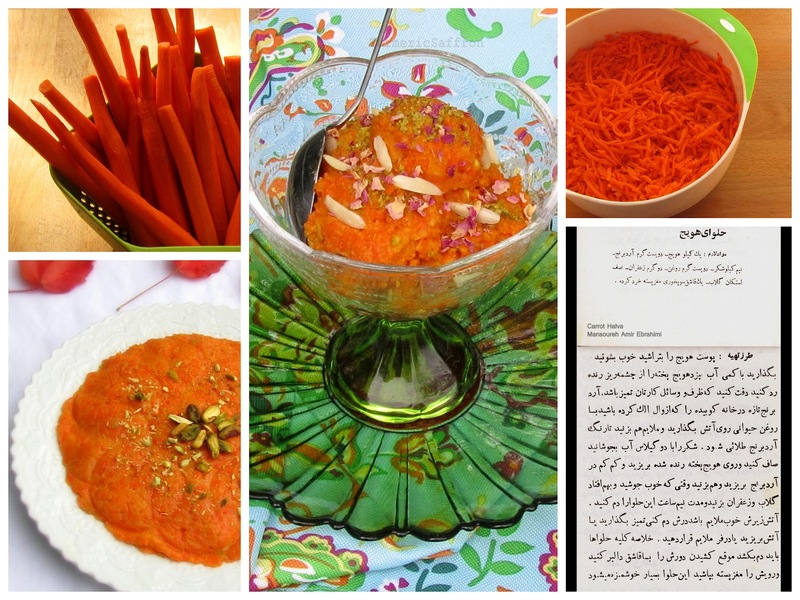 For those of you who read my blog regularly you probably know that this blog is solely dedicated to Persian home cooking, the kind of food that I grew up with, and that I also write about recipes from different regions of Iran that I mostly learn either from my good friends or from reading those few authentic Iranian cookbooks out there. However, this time, I'm going beyond posting my own recipe or writing about a mahali (regional) recipe from somewhere in Iran. 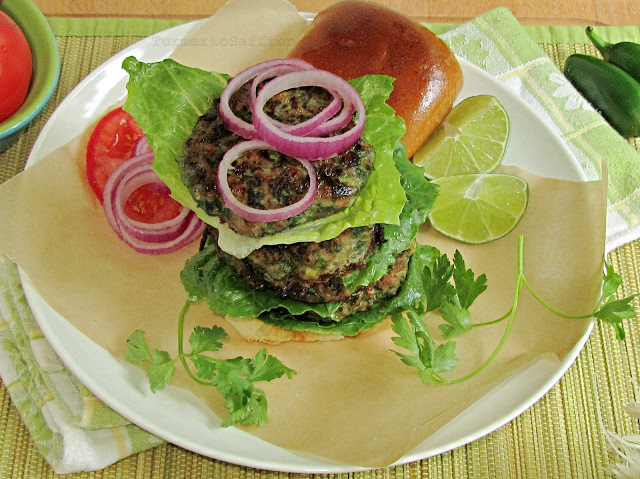 For this turkey burger recipe I am going back several hundred years into ancient Persian history when a large number of devout Zartoshtian-e Irani (Parsi) fled their homeland after the Arab invasion and migrated to south of India in the 10th century AD, because of religious persecution. Zoroastrianism was the dominant religion of the region at the time and was founded by Zartosht (Zoroaster). The important message of Zoroastrianism is pendar-e nik (to think good thoughts), goftar-e nik (to say good words) and kerdar-e nik (to do good deeds). There's a well-known story about the Parsi settlement in India and their cultural absorption. It's been said that the ruler of Gujarat, Jadi Rana, was not very welcoming and was concerned about over-population problems. In a meeting with the king, the Parsi leader asked for a full glass of milk and a spoonful of sugar. Then as he gently added the sugar into the glass of milk without any spillage he said, "We are like sugar, we will only sweeten your country." The Parsi community blended and thrived well in India while it also maintained its religion. 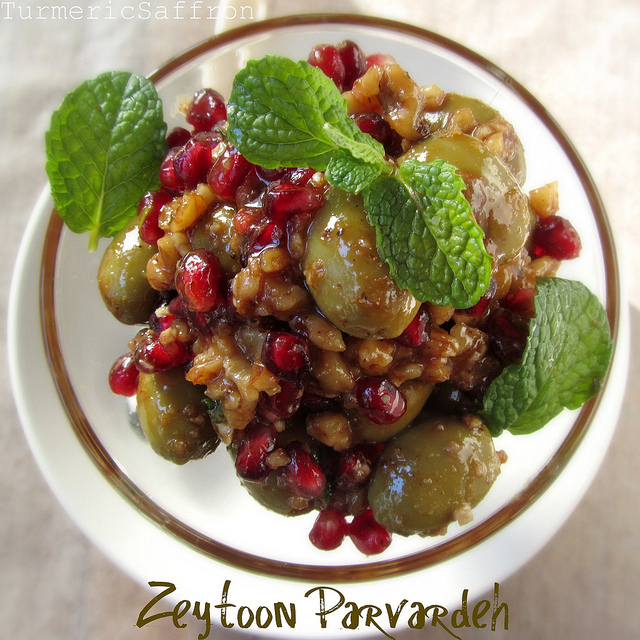 Parsi cuisine, with its roots in ancient Persia, is a unique combination of both Indian and Persian style cooking. I had read about Parsi food while reading other food blogs over the past few years but it wasn't until I came across the wonderful book, My Bombay Kitchen: Traditional and Modern Parsi Home Cooking by Niloufer Ichaporia King that I became tremendously intrigued and decided to write a post about it. Her story and her Parsi recipes have totally won me over. Plus, I am passionate about all things Iranian even if it's a thousand years removed! On a more personal note, one day, a couple of years before I was born my mother met a young Zartoshti couple with two adorable little girls during a sizdah bedar outing. One of the girls' names was Azita and that was the first time my mother had heard that name and decided she was going to name her next baby girl Azita. It took her months to persuade my father who had a very uncommon name in mind. I am grateful that my mother met that family before I was born and that she didn't waver under pressure. 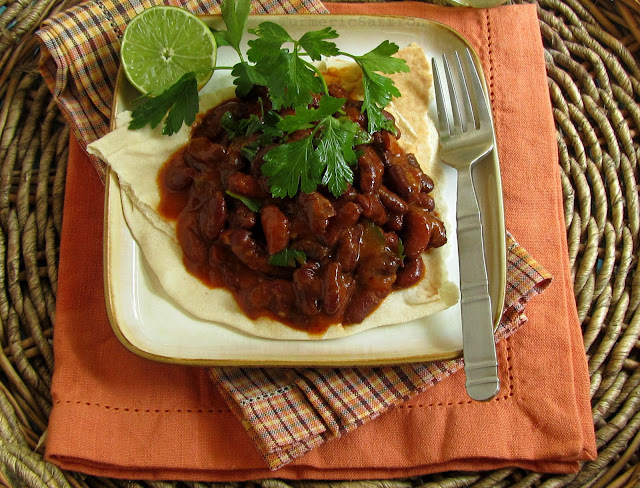 This recipe is adapted from Niloufer Ichaporia King's, My Bombay Kitchen. I tweaked the recipe a little to my liking by reducing the amount of pepper and fresh ginger by almost half and substituting the optional fresh mint with parsley. 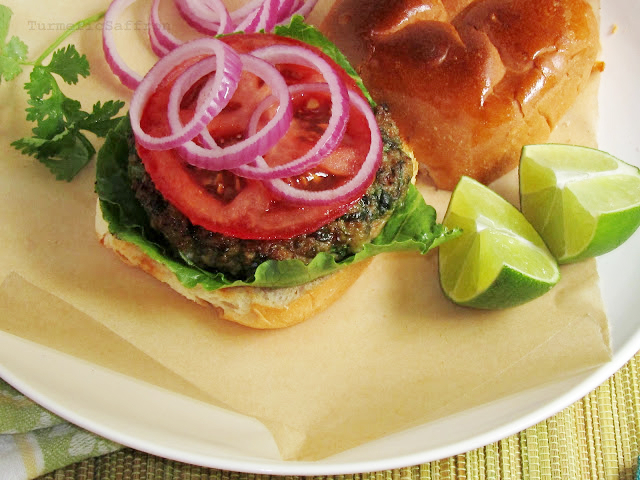 This recipe can be made with ground chicken as well. In a large mixing bowl combine ground turkey, green onions, cilantro, parsley, green chiles, egg and salt to taste. Mix all ingredients thoroughly by hand. Heat 2 tablespoons of vegetable oil in a skillet over medium-high heat. 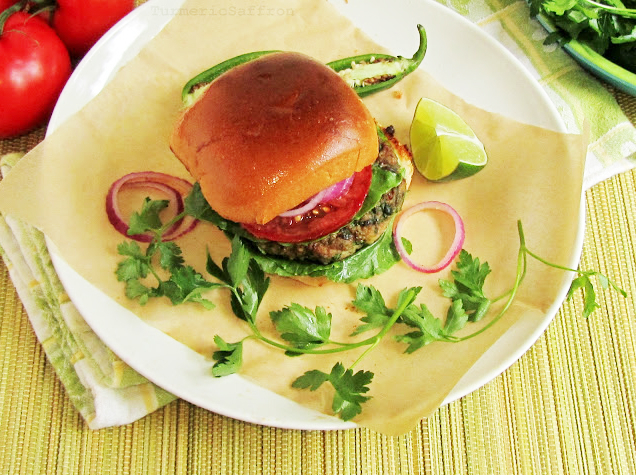 Take a handful of the turkey mixture and form into a patty. Place the patty in the skillet and fry until brown on both sides. 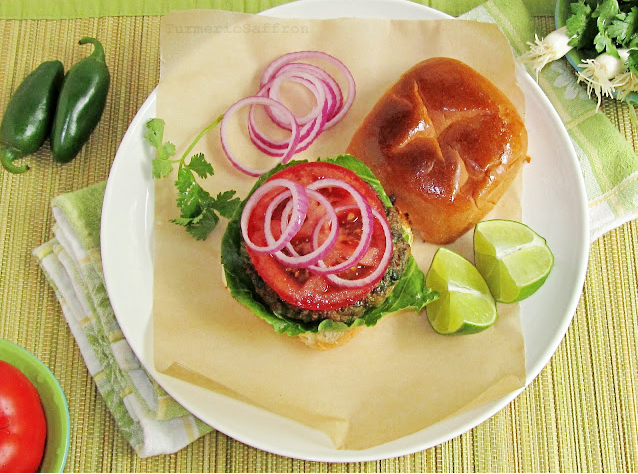 Serve on a bun with lettuce, tomato, onion and pickle. 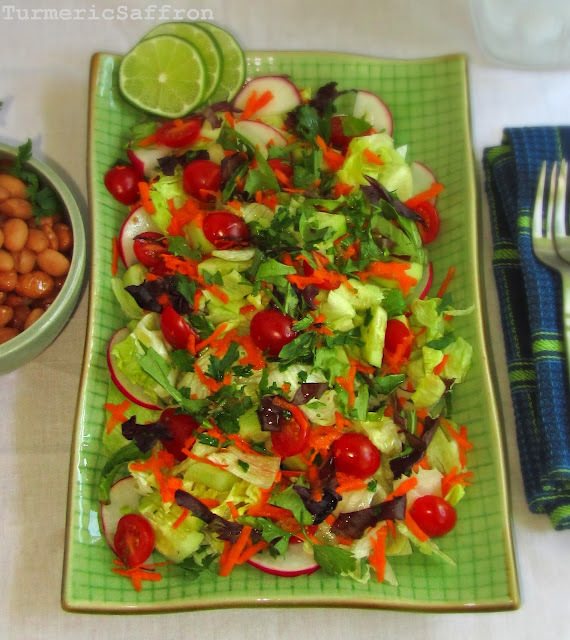 This chopped fresh vegetable salad with a scoop of delicious cooked loobia chiti (pinto beans) and a generous amount of lemon juice and olive oil dressing was my favorite summer lunch growing up in my home in the south of Iran. My mother's way of preparing salad was to chop all the vegetables into bite-size pieces so we didn't need to use a knife to cut the lettuce and tomato wedges. Usually, when you think of Iranian vegetable salads the well-known salad shirazi comes to mind where Persian cucumbers, firm tomatoes, yellow or red onions are chopped into tiny pieces and served with oil, lemon juice/verjuice and dried mint dressing. However, this simple mix of lettuce, tomatoes and cucumbers is the other popular salad that is often served with most meals.You can just make a basic fresh salad or add (har chi doost darid) anything your heart desires depending on the seasonal availability. Summer is the time for salad to shine as the main course by turning an ordinary salad into an extraordinary delicious meal. With six kids out of school for the summer and my father's preference for freshly cooked meals, making hearty salads was my mother's way of staying away from standing over a hot stove during those really hot summers. For many years we lived in an old-style house where the kitchen was located across the hayat (courtyard) away and separate from the dining area, living room and the rest of the house. The kitchen was small with a few cabinets/shelves filled with pots and pans and with only one window and no air conditioning. It was in that dreary matbakh (kitchen) that anything Maman made tasted wonderfully delicious. Her pinto beans were exceptionally tasty. 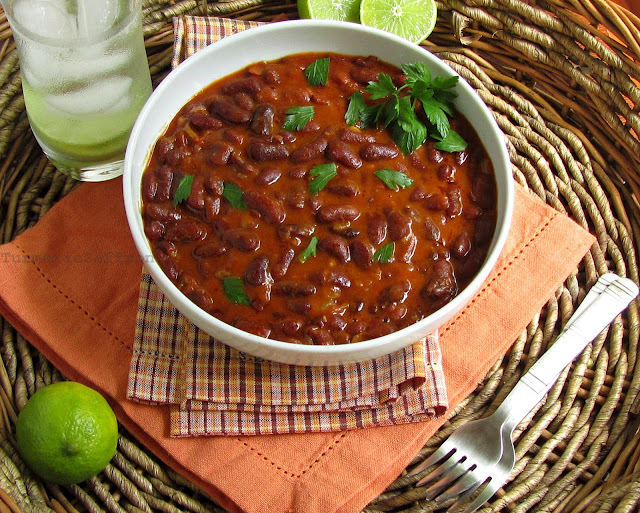 Her secret was using good olive oil and freshly squeezed lime juice and she would always serve the pinto beans in a large clear glass fish shaped platter. 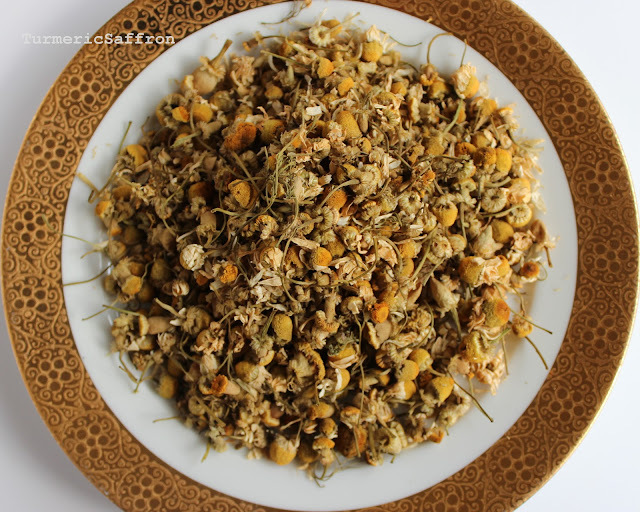 It was in that dark and removed kitchen in a small town in Khuzestan where the root of my inspiration and passion for my Turmeric and Saffron blog was formed. 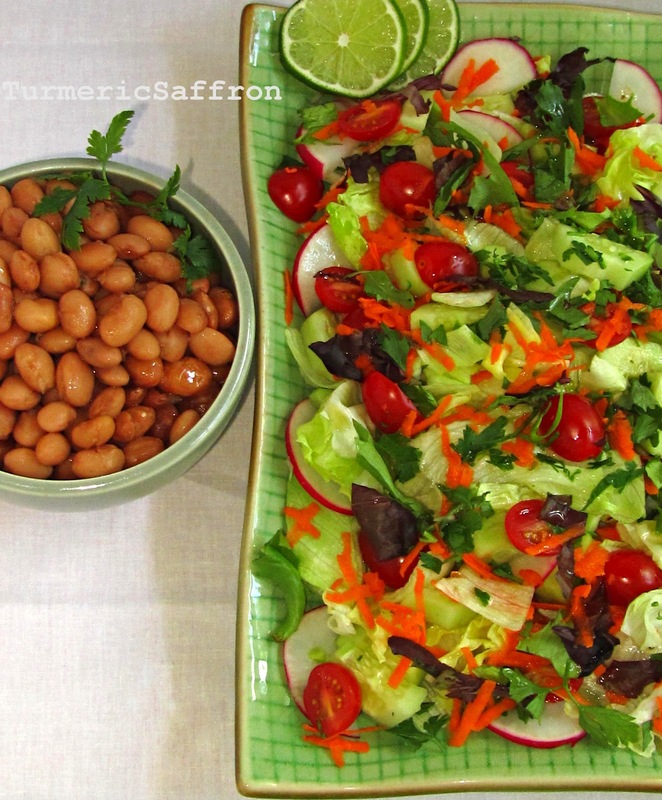 I love to make سالاد تابستانی با لوبیا salad-e tabestani with beans and as many fresh and colorful vegetables as possible and serve it in my eat-in kitchen that's not just a place to cook food but rather the center of our home where we come together, talk, make decisions, eat food, greet friends or just hang out. 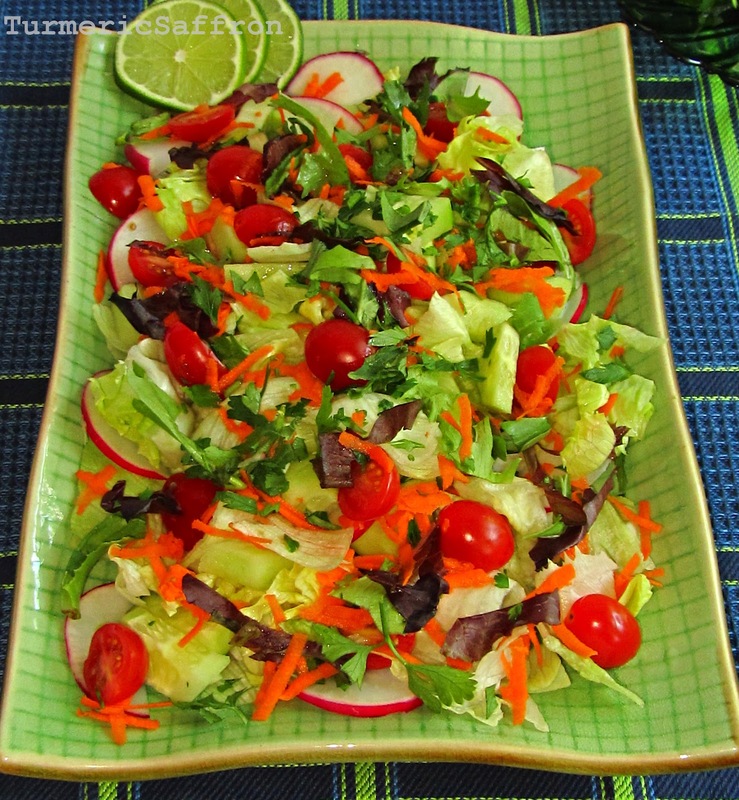 In a large salad bowl toss all washed and chopped ingredients and gently mix well by hand. Drizzle with your favorite salad dressing. 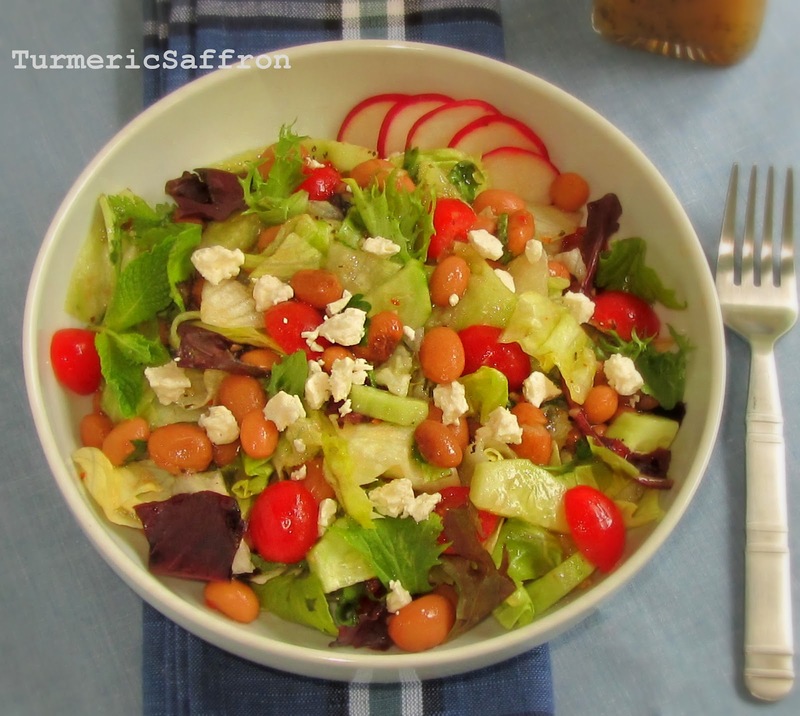 You may sprinkle the salad with crumbled feta cheese. 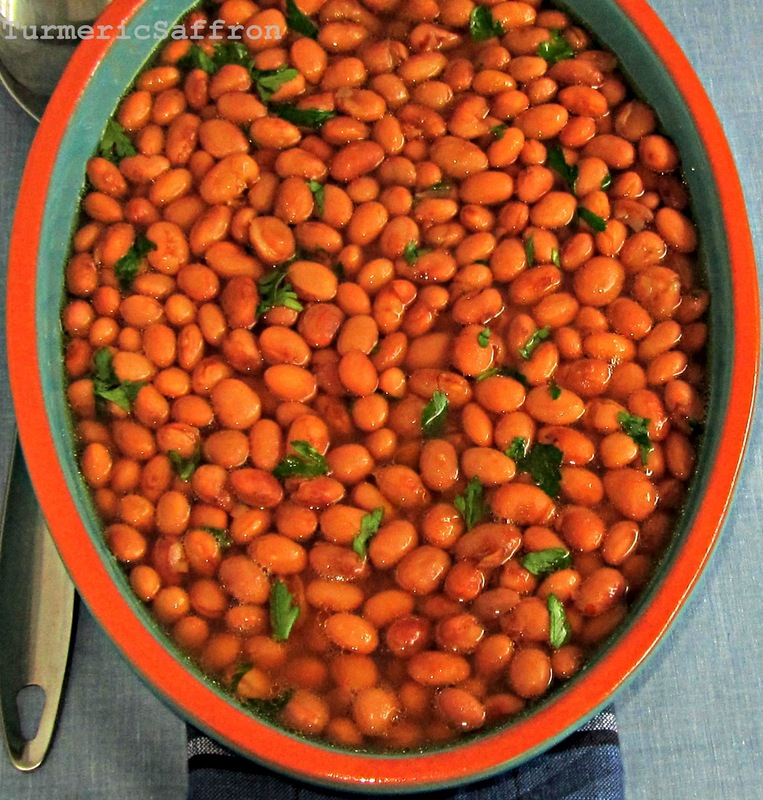 Drain the soaked beans and place in a large pot. Fill the pot with five cups of water. Bring the water to a boil over high heat. 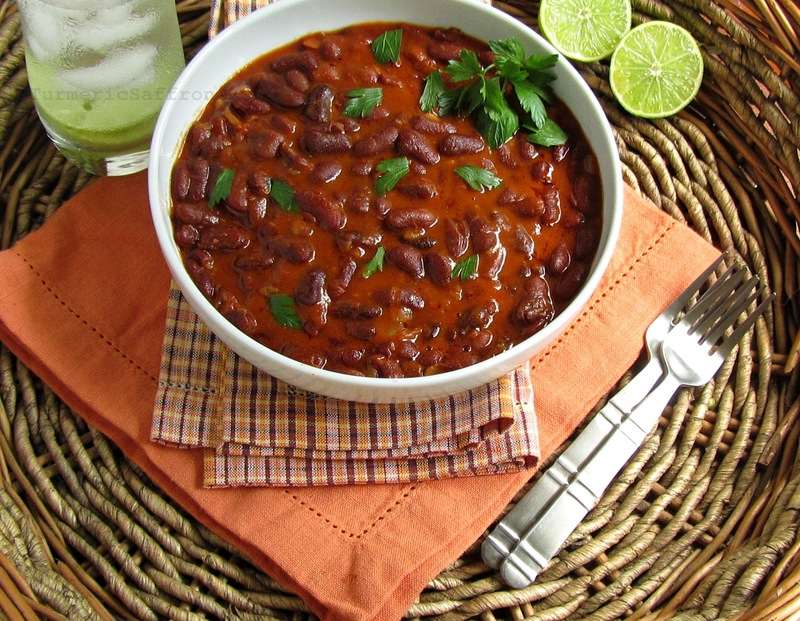 Reduce heat to medium, cover and cook until beans are tender, about 1 1/2 hours. Add olive oil, lemon juice, salt and pepper. Simmer for 10 minutes over low heat. In a small mixing bowl combine all the ingredients together and mix well using a whisk or a fork. Taste and adjust the seasoning. Drizzle the dressing over the salad and serve.